This is a route about quality of tracks, not just getting from one side of the country to other. If that’s your aim, then get on a bus and enjoy the views. Yep, this may seem like another short day, but look at the ascent. It will be a long day, and albeit avoidable, how on earth can you come into the Dales and not ride through Bishopdale and then Swaledale. This is a great ride from Hawes up a rocky trail, along the Cam Road and across to Bishopdale, before descending eventually down Stake Allotments back down into Wensleydale, then climbing up and down into Swaledale – three Dales today! Some guys may do this stage on the same day as the previous one, but do think carefully about this. If you’re not used to the area or the hills, it may become ‘not nice’ and a chore to make it to Grinton, falling into the Dales Bike Centre knackered and unable to fully enjoy the evening. We keep saying this, but cycle to your normal levels and enjoy the holiday. Take time look after the bike and yourself, and you’ll enjoy this and the previous stage so much more. 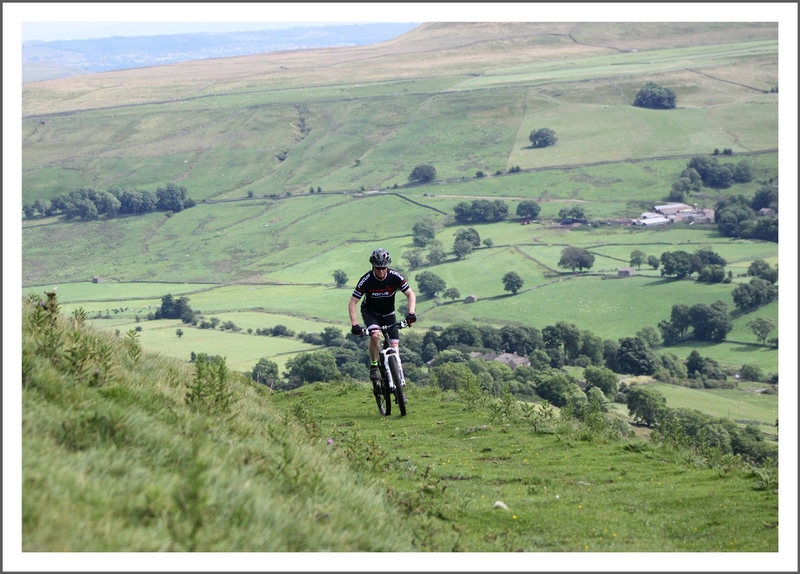 The Dales MTB Centre is our preferred stop over tonight, with it’s grade A bunkhouse that is better kitted out more than most B & Bs, and with staff on hand to fettle the bike – if you get there in time! 1. From Hawes take the minor road off the Main Street that climbs steeply from the western edge of the town and up through the hamlet of Gayle. At Gayle a red post box in the house wall indicates a junction to turn Right into, soon passing a small play park on the right. This narrow lane winds and climbs to a T junction by open fields and a drystone wall opposite. 2. Turn Right. Known locally as ‘Gaits’, follow this lane to another T junction—Moss Lane. Turn Left. This climbs steadily, passing BW (Bridleway) signs and a track junction to the right for the Pennine Way, continuing straight ahead as it climbs and twists down left, through a metal gate and eventually crosses the beck before re-joining the road — Fleet Moss. Now the climbing begins. 4. Fleet Moss eventually levels out at its summit and a BW is seen to the Left. This is the ancient Cam Road. A grassed and hard packed surface leads quickly to a rocky track that gently climbs before the fun begins and the gradient falls in favour of the rider. Ride this at speed (safely) over the hard packed surface as it races down, providing some technical line choices on route. 5. The next section is easily missed as you’ll very likely be whizzing along, so take care: After 1 ½ miles a sharp twist to the left then right is soon followed by a BW gated to the Right and signed ‘Crag Side Rd.’ Do not miss this or you’ll end up in Thoralby off route. Do look out for a large metal field gate that leads to a rocky double track which twists and dips before petering out, becoming a tussocky grassed track that continues down and left, before a gently rise and traverse of the contour line. The downhill then continues, racing you down to a gate which leads onto the narrow tarmac lane. 6. Turn Right through the gate and ride down the narrow tarmac road, crossing the bridge over Semer Water, and heading Right, climbing gradually to Stalling Busk where the BW (High Lane) is joined. 7. This excellent rocky double track ascends the tight dale with superb views over Cragdale Moor to the right. At 2 miles the track steepens before levelling out and joining Busk Lane near the moor top. Turn Left towards Stake Allotments, which is shown on OS mapping but not on BW signpost. 8. After ½ mile a further BW to the Right is signed off the Stake Allotments drove road to Thoralby, leading you across meadowland to Bishopdale. Speeding across the descending meadow, passing bridleways and footpaths to the right (ignore these) the grass turns to rock and scree and the drystone walls close in on a twisting descent towards Thoralby. 9. Turn off this BW before reaching the village, at a point where it turns down sharply right. A gate to the Left in the drystone wall here signs a further rocky BW that climbs alongside a meadow. This meets a grassy and indistinct path which is crossed at 45° to the far right corner of the meadow. Now descend the tricky section before entering the walled lane and crossing the beck (Folly Lane) , climbing to the track junction. 10. Turn Right and follow this track down to the road (A684) turning Right and cycling into Aysgarth, before turning off Left towards Carpeby for a well earnt rest and brew at the National Park Visitor Centre (by the old railway). After resting and refreshing yourself,, cycle on to Carpeby, turning Right into the village. 11. Turn left directly after village hall onto Hargill Lane. Climb steeply with drystone walls either side. A rocky track is reached as the gradient eases and two barns can be seen on the right of the pathe path. Some 200 yards after the 2nd barn on the right a indistict track leads off to the left, leaving the rising rocky track. A metal gate leads to the BW beneath the escarpment . 12. Riding with the drystone wall to your left and steep hill to your right, the BW rises to a further metal gate before easing off. 200 yards further on the rocky track rises to the right, with craggy limestone and old quarry workings immediately to the right of the BW. Passing through an open gateway (no gate present) in the wall, the track splits. Keep to the lower track / BW which initially falls with the wall to its left, before twisting right. A communication mast can be seen 1/4 mile away atop the craggy hill. The BW then goes off left, though a metal gate in the wall, leading to a smooth grassy track beyond. 13. Keeping the steep rocky escarpment to your right, this track descends at speed, passing reassuring BW signs by old mine workings . Grass gives way to gravel and a gate is soon reached by a waterfall (above Hazel Bank). Cross over the large wooden bridge and follow the track as it twists left. A further wooden gate is soon reached, leading to a rising track and BW junction. Ignoring the gated BW left, follow the route ahead signed ‘Askrigg Moor rd 2 3/4 ML’. 14. Go through a small metal gate and climb the steep meadow keeping the walled copse to your left. At the top of this meadow a BW sign indicates the way ahead. A grassy track now climbs steeply to a wooden gate and a rocky panorama. Turn right at this point along a very rough double track beneath the screes. This soon improves to an excellent rocky track which twits as it rises, soon bringing the earlier communication mast into view once more. Climb on, rounding the hill (Beldhaw Hill on OS map) and keep the wall to your right hand side. The BW crosses upland meadows, passing through 2 wooden gates on route to the escarpment beyond. Through the second gate the track bends right and climbs above the rocks. Keep the drystone wall to the right as you climb upwards, eventually viewing a small shooting hut in a wall ahead and to the left. Stay close to the wall on your right and follow this indistinct track across tussocky ground to a wooden gate and rocky moorland. 15. The heather clad track passes shooting butts to its left, whist you continue along keeping the wire fence close on the right as the sweet Swaledale singletrack sweeps you along. The BW eventually dips to cross through the fence at a gate, climbing up and left as it continues towards a derelict barn above the road. Sweep around the barn and right and drop down behind it to the road; a final sting in the tail awaits as the singletrack rises steeply just before the tarmac. 16. Turn Right and follow the road for 2 ½ miles, keeping Whitaside Moor to your right. A rocky double track BW then leads off right, back onto moorland, twisting and climbing. 17. After approximately 1 mile a indistinct BW leads off through old mining rocky debris on the Left. The track is technical at times, twisting and dropping onto sweet singletrack across heather moorland which descends to the shooting track across the moor. 18. Stay on this BW, ignoring all others in this myriad of tracks and paths, as it rises and falls, before one final fast descent to the Grinton road. For those riders who have booked accommodation at Grinton Youth Hostel, then well done, as you’ve reached your halt. If not, cycle safely down Grinton Bank and head straight on to the Dales Bike Centre and a hearty meal!